So just some thoughts going round in my head for possible future builds. Torpedo bombers based in Malta? wellingtons, swordfish and Beauforts, I know of but have very little knowledge and can find very little reference info (it’s malta so that makes sense) as to what they looked like. I know wellingtons were 38 and 221 sqn and worked at night so pretty much guarantee black lower surfaces. But any info on marks? I’ve found a few pics of wellies being loaded with fish and they appear to have their front turret removed. swordfish were, 815, 828 (mainly albacore?) and 830 from what I can find and preformed many roles, recce of shipping, mine laying, and assault of shipping with torp’s and bombs. I’m sure I’ve seen a few profiles of them as black with camo uppers, maybe one with an M on it’s tail? any way any info on wellingtons and swordfish flying out of Malta world be helpful? Anyone build any representations of these? 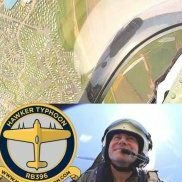 @tonyot is a member on here and might be able to help.. Yes Tony’s book! A very helpful man. I’ve been wanting a copy for some time, maybe this is the time to take the plunge. A birthday present to myself! For the Wimpey`s,..... they were based on the Mk.Ic. 38 Sqn operated torpedo armed Wimpey`s (nicknamed `Fishingtons) and they were not radar operated. One of the pilots told me that the nose turret was removed to improve visibility at low level for the pilot and there was a torpedo sight fitted to a frame in front of the windscreen,.... the pilot say that it had pegs nailed onto a cross bar which they used to aim off for the speed of the target. Camouflage was standard bomber scheme. Later Wimpeys had radar and were Mk.VIII`s and at first these were simply used for maritime recce at night to find the Axis convoys. When found they would call in the naval Swordfish or Albacores and then drop flare behind the convoy while the navy lads dived down and came in from the other side with their targets silhouetted by the flares. Later still,..... as more Mk.VIII`s became available they were used in the torpedo role themselves,..... usually where convoys were out of range of the naval biplanes. For the Mk.VIII`s,....... those from 221 Sqn appear to have worn the white/TSS coastal scheme but had black u/sides/ sides applied prior to their Malta attachment,...... so the upper surfaces could have been TSS,...... or they could have been fully repainted in bomber colours,....... I`ve not been able to find out for sure,.......sorry! This is great news! I was hoping you would say a mk ic as that’s the kit I have! What the best way to get your book Tony? Or does it not make a difference to you? there have been written quite a few articles and books about the RAF in Malta during the siege. Also the colleagues of IPMS-Malta or the staff of the Malta Aviation Museum usually are very helpful. There is a good book on the Malta-based Beauforts or better a story about the squadron (No.39 Sqn RAF) by WCdr (ret.) Patrick Gibbs,DSO,DFC and Bar . The book is titled "Torpedo Leader" (ISBN 0-905778-72-3). Additional info you can get from the various books about the "Beaufort". Malta Aviation Society and the msueum have done several publications, mostly periodicals on Malta 1941-1943 and there are some pictures in these as well. A very good book, too, is "Malta George Cross - Victory in the Air" by Richard J. Caruana, whom we all know by his impressive drawings in various - not only UK - magazines and books. (ISBN 1 971767 12 1) Published by Modelaid International Publications, 80 Triq San Gakbu, Luqa LQA 02, Malta. There never have been complete squadrons in Malta except fighter squadrons, mostly detachments for the one or other particular purpose. The reason was that food, material and petrol were very much restricted and the main purpose was to keep the island defendable. Iassume that the Axis had more torpedo-units around malta than RAF ever could have mustered there. Don´t think of large scale torpedo attacks on Axis convoys - those attacks very mainly made by one or three aircraft at a maximum. The danger of being hunted by Bf109 and Italian fighters was too big. Most Axis surface vessels were sunk by bombs and mines, the aerial torpedo attacks were, like the ones made by the Axis very costly with little result. E-Boats, MTB and submarines were the game of the day then. As usual, the colour-question for Malta-based aircraft will arise very quickly and there certainly are members a better informed than I am on this partiucular topic. However I would prefer DSG/EDSG over sky or azure blue for the CC-Beauforts there. For the Beaufort it depends on what scale you are intending to build. Special Hobby made a decent short-run-kit in 1/72nd (no. SH 72083) with Malta decals as well. It should be the Mk. I and/or Mk.II version. Not easily to be built but worth the effort. For the Swordfish there is only the new Airfix-kit which is excelelnt. The did the famous Taranto-raid from Malta bur were based on an aircraft carrier and only for "stop-over" duties in Malta. According to my info, Wellingtons only were used to ferry torpedoes to malta not as a torpedo aircraft itself. But please correct me if I am wrong. No. 148 Sqn used the Wellington Mk. IC as bombers - in January there were 10 of these Wimpeys in Malta forming the "Malta Wellington Flight"
Unfortunately it doesn`t appear to be one of those that you can pick up cheaply 2nd hand,......if anything it it getting more expensive! I’m in Malta in June so will be checking out the museum etc there, very much looking forward to it! ive read the torpedo leader by Gibb and found it great and tells a lot about Beaufort and beaufighter action on the island and how torpedo bomber tactics were formed. I’ve also read ‘the last torpedo bomber’ about Arthur Aldridge who spent a lot of time flying from Malta with the beauforts (he had a slightly different opinion on Gibb than Gibb had of himself) it’s a great read. Arthur also moved to my home city after his service and taught at a local school, ended his days just down the road from me, unfortunately only found this out after his passing. thank you for the heads up on the other books, I hadn’t heard of. I’ve also read ‘fortress Malta’ by Tom Holland, which really is a great read, more from a human interest point of view. @tonyot looks like direct from the publisher is the most cost effective! But a good sign that it’s going up in price for 2nd hand! I remember you mentioned about a 2nd book when you helped with my spitfire and hurricane (my kids love them! As do I) is this still a no go?? Thanks again for the help then and now mate, it’s always appreciated. So far I have managed to get a lot more info to work on for the wellington ‘fishington’ (love that) and swordfish, so will buy Tony’s book once payday rolls along to get a better idea. Beaufort will have to wait I feel till I can justify getting the kit! .if anything it it getting more expensive! It night be worth trying the Book Depository, their price to me in NZ is roughly what Amazon is wanting for a copy in the Uk plus post. I've had this book for several years now, pure magic. I know the early ones were used in support of Beaufort attack’s e.g. Beauforts dropped the fish while beaufighters drew fire by strafing with cannon and MG fire, also dropping (retro fitted) 250lb bombs, and according to Arthur and Paddy Gibb glass bottles if supply’s were low... basically anything they could to increase the chances of the Beaufort a) hitting the target b) surviving the attack! Daylight attacks sound utterly terrifying! Arthur describes one attack of flying straight at the target as low as they could, at a wall of flack. In about 5 seconds the first box was wiped out, one taken by flack, the next the pilot was hit while dropping his torpedo and crashed into the sea, and the third was hit by the torpedo as the angle was wrong and it bounced off the sea through the third aircraft... and the others had to keep on flying! I can see why Gibb wanted a change in tactics. Interests:RAF from WW2 to Herrick, esp 13 and 39 Sqn. 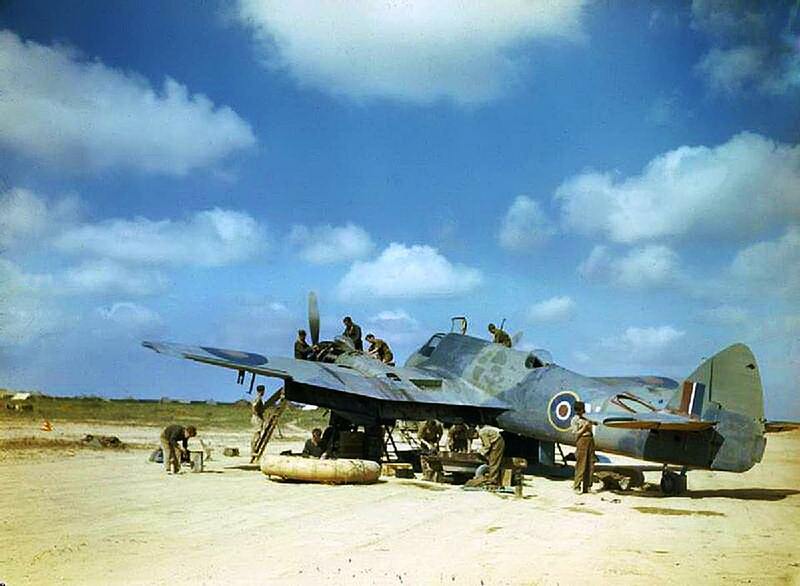 39 Sqn utilised torpedo equipped Beauforts from Luqa from ‘41 to ‘43 with quite a few gallantry awards won by the Sqn. The book ‘Torpedo Leader’ by Patrick Gibbs DSO DFC* gives a great account of the sqn’s time in Malta. *just seen you’ve read this!! There are several combat reports of Wellington torpedo bombers out of Malta in the new Mediterranean Air War series, but of course you do get a lot more for your money with those. Torpedoes on Beaufighters came too late for Malta based operations, and the whole business of torpedo attacks rather fell out of fashion, largely due to the lack of targets for such specialists. For Malta operations you could also consider Albacores, which were much more active and effective in the Med than is generally recognised. I have indeed but thank you all the same! Ralph Barker was an author who published several books, but not AFAIK a Beaufort pilot himself. You are thinking of Campbell who succeeded in an attack on a German battlecruiser in a French harbour. There were suggestions that Beauforts in the Med were painted Light and Dark Mediterranean Blue on the uppersurfaces, but this has never been confirmed. I would however expect Azure Blue undersurfaces. 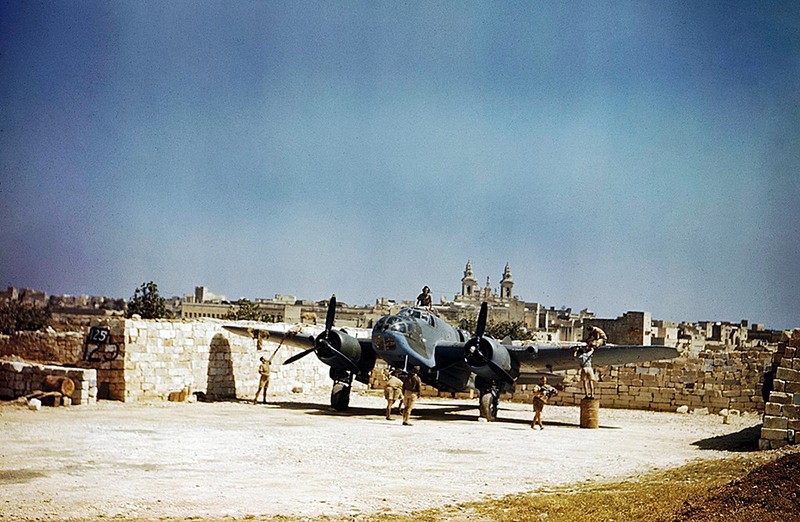 I've a feeling that there is a Beaufort in the background of one of the colour photos from Malta, but this one appears to be TSS over Azure Blue. No worries Rob,..... always glad to help where I can mate. As for the 2nd book,.......it ain`t going to happen,.... sorry. I was well into writing it and the last chapter of the 1st book was chopped out at the last minute,....... so that would have been the new 1st chapter! Unfortunately the publisher has never got back to me and has not published another book,....... plus the experience wasn`t the greatest to put it mildly......... we`ll leave that there I think! The radar equipped Wellington`s were known as `Goofington`s',...... as they had a goof around for convoys,...... usually using Ultra info to gauge the position as the time that convoys left were transmitted by radio and intercepted. Now I may be well off here,....... it is only a theory after all! Form the photos the theory looks a good one Tony! I’ve seen a few of these pics before and never thought about it till you pointed it out and compared them together. shame about the book but at least the first one made it out! firstly good luck with your research work in Malta. Ray Polidano is the head of the museum there and please pass on my regards to him. Nice fellows there. In case you have the chance, step by IPMS-Malta. They have their "home" near Valetta and usually meet once a week there. The talks there are inspiring and I remember some hours there discussing German and British aircraft colours. I have been into this topic for some considerable time and of course the different theories about painting and re-painting are still very much discussed there, too. Firstly we should only compare colour pictures from the same time and I rather doubt that the three pictures above are from the same time. Secondly we should not compare land-based RAF-aircraft with those painted for overseas use and those used by Coastal Command and FAA. All three used difefrent colours according to the respective AMO in use at the respective time. I am afraid that we might mix up several things here and we should not rely on old colour pictures of different films too much. Many were b/w-pictures colorized later and many have faded and changed colours due to type of film, heat and other influences. The three pictures posted before (copyright?) seem to be real colour pictures however with different stages of weathering and colour-distortion. The most important thing however is that we do not know much about the time and pülaces where they were taken. This would be something - in my opinion - which is crucial for real historical work. BTW - I would call it a rumour that US-colours were "freely available" in North Africa - at least not before the end of 1942/ beginning of 1943. AMO required distinctive paintings and camouflage schemes for RAF-, CC- and FF-aircraft at the different theatres of operations and it can be given as a rule that they used British paints according to AMO with little exceptions there. It is rather unlikely that aircraft were repainted without neccessity in NA due to lack of facilities and material. No SqnLdr or commanding officer was entintled to have "his" aircraft been painted according to his taste... neither in the UK, nor abroad. When a Sqn was called to go over to NA it mostly was at short notice and many aircraft wore their initial colours. In NA only the Desert scheme was appropriate with some exceptions concerning repainting in NA, e.g. green insetad of brown as second camouflage colour etc.. Same with the assumption that "many aircraft" were repainted TSS in North Africa. Some Malta-Spitfire camouflages still are some kind of mystery but Paul Lucas´ recent research work on these gives us some idea of what might have happened with these Spitfires bound for Malta. However most of them simply were painted in Desert scheme and Malta repainted them in some ways for better camouflage over the Mediterranean, not in the pens on Malta. The Halifax pictured above must have been is from No. 301 Polish Sqn "GR". The new No. 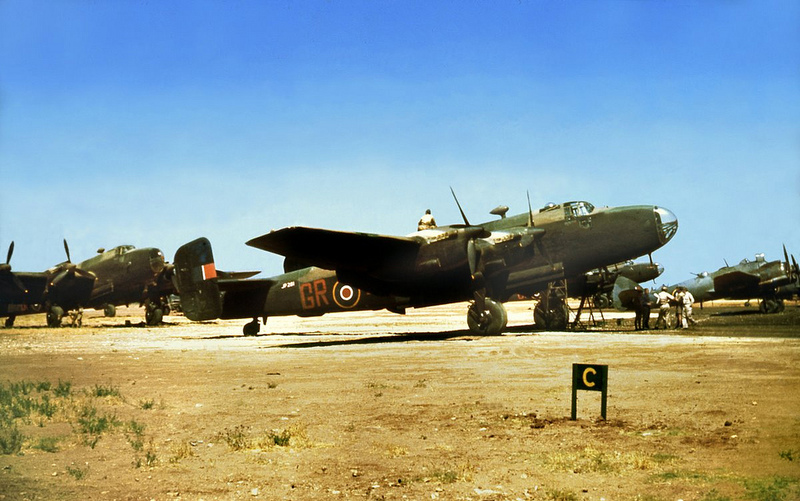 301 Sqn received their Halifax in 1944 and opeated them out of Brindisi as part of the Meditarranean Allied Air Forces. The aircraft were painted in DE/DG with underside painted in "Special Night". The Beau in the back of the Halifaxes most probalbly is not a DD-aircraft but a day-fighter aircraft of Fighter Command which DG/OG camouflage and medium sea grey undersides. Unfortunately we cannot trce the unit. The Beaufort however is with EDSG/DSG camouflage according to CC-requirements and the underside Sky Blue or Azure. Both were allowed for overseas use, i. e. North Africa. There are several prints of this picture and the blue underside should be out of question as well as the standard TSS-scheme. I think it is a fairly new Mk. II and given it was used by No. 39 Sqn it could have been pitured during the time June 1942 to September 1942. In August 1942 all initial aircraft of no. 39 Sqn were lost. After that time in August No. 39 got aircraft from No. 217 Sqn and No. 86 Sqn rsulting in a strength of 20 aircraft. the unit operated from Malta for another month until the end of September the same year. when it was withdrawn to Egypt on 1st October 1942. You see, there are two years between the two pitures and thus also some changes in the respective AMO with regard to painting. The Beaufighter pictures last - in my opinion - does not carry the TSS, the contrast is too big for this camouflage, especially when weathered. We should know the original picture and the colours there - it could be a heavily weathered and locally repainted TLS where DE had been repainted with Light Stone or something similar. The Beau seems to be a Mk. I or Mk. Ic if you have a look at the oberserver´s cupola, the air intakes and the flat tailplanes. The pictures must have been taken after May 1942 according to the C1-roundel on the fuselage. In SAM-Publications´ Modellers Datafile "The Bristol Beaufighter" there is a picture on page 140 showing "K" in the Middle East and the caption names Middle Stone and Dark Green as colours for the upper side and Azure Blue for the bottom. However the time might be earlier as the fuselage roundel there is of the earlier type "A!" The camouflage is of the same way of painting from bottom left to top right and the might be the assumption that this aircraft is from the same squadron (perhaps No. 272). Did the Baltimore never operate as a torpedo bomber out of Malta? Heres a Special Hobby Beaufort. Beast to build. Interior does not really fit. The Halifax picture is late 1944 and nothing to do with North Africa. The Baltimore did not operate as a torpedo bomber ever. It did operate as a GR aircraft and photos of it in "Coastal White" do exist. At least one of these appears to have been taken in Malta. The final Beaufighter photo certainly looks like TSS to me, compare it to those well-known examples of of Seafires taken in Indomitable in early 1943,. and nothing like a Dark Earth/Mid Stone combination, however weathered. TSS did have a fairly high contrast in colour, which is captured or even exaggerated on some b&w film/filter combinations - it can also appear as very low contrast, so is very difficult to identify to a high certainty on b&w unless some other colour can be identified (usually the comparative appearance of the blue and the red). Torpedo bombers are my favorite subject and RAF Torpedo bombers in particular. In the case of Malta it comes down to four types. First and foremost the Beaufort. I have read both of Patrick Gibbs' books, one about UK operations and the other one about Malta. Fascinating individual and for years now I have been waiting for a decent release of a 1/48 kit of this beautiful plane. The second type or rather types are the Swordfish and the Albacore of mainly 830 squadron. There was a decent work about this "Night Strike from Malta" by Kenneth Poolman. They flew short range missions in the straights. They used those goofy barrel tanks in the observer's position just like at Taranto. The last type is the Wellington. They did fly night torpedo strikes in the Summer/Fall of 1942 and hunted the German convoys as far out as Greece. Unfortunately there is very little written about them and the one gem I was able to find is here http://www.bbc.co.uk/history/ww2peopleswar/stories/60/a2204560.shtml Ossie Evans mentions being trained on torpedo Wellingtons and sent out to Malta in July 1942. He flew dangerous night missions on Fishingtons, "Limey Ragships" a.k.a Wellingtons armed with two torpedos. In his text he mentions HX 604, which was an ASV equpped Wellington with the aerials on the fuselage. In Malta they were called Sticklebacks or Goofingtons. A good reference to that plane was also made by Tony Spooner, who wrote about his service in Malta in a book "In full Flight". I believe there is even a decals option in 1/48 available. The basic operation went like this. The Goofingtons went out towards where ULTRA had suspected Axis convoys of crossing the Med. They located the convoy and then sent out radio signals for Fishingtons such as those flown by Ossie Evans to home in on and find the convoy. Once located the Goofingtos would drop flares to illuminate the ships and the Fishingtons would drop their fish from the other side. Ossie mentions his first torpedo strike in September 1942, therefore right at the height of the African campaign at El Alamein. He was an inspiration for me to build my 1/48 Wellington Mk VIII with the front turret removed and the "rake" torpedo sight seen in pictures and also mentioned in his text. I made it "W" for William HX 565, but unfortunately cannot post it here because I can't figure out the posting of my pictures. I based it on the Trumpeter kit with modifications. One day I may attempt to make Tony Spooner's Goofington as well. If anyone knows more about the torpedo Wellingtons from Malta I would love to read up more on them.